I am a big fan of stir-fry because: 1. Anything goes 2. It’s quick 3. It’s easy. On one of those Saturday afternoon when I can’t be bothered making anything, but can’t be bothered going out to eat, I decided to make this simple, delicious stir-fry noodles. The universal rule for all noodles is to start it off dry and crispy. Now, to prevent starchy, waterlogged noodles, it is important to boil it in saucepan of boiling water, strain it, then run cold water through the noodles. Before you even start to stir-fry your condiments, dry out the noodles and get some crispness into them by lightly frying it in a heated wok with one tablespoon of the cooking oil of your choice. 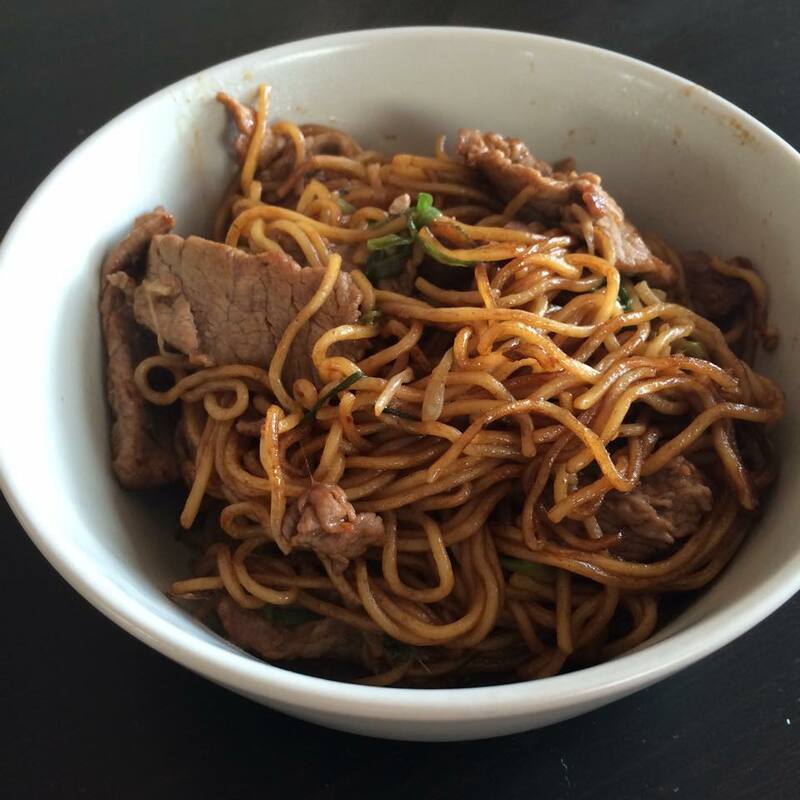 Having a good sauce recipe can elevate your stir-fry from mediocre to legendary status. Most Chinese stir-fry noodles tend to stay with the same basic ingredients, which are easily found in many (Asian) pantry: Sesame oil, Soy sauce, dark soy sauce and Chinese Shao Xing cooking wine, plus a dash of salt, sugar and white pepper. High. Always start with the maximum heat to get that unique charred/slight burnt taste typical of Chinese restaurants. Of course we’re not encouraging eating burnt meals here, so do turn down the heat to medium when necessary. But having the heat on medium-high to high prevents condensation and waterlogging, which happens easily enough when you have so many yummy ingredients crowded in the wok. Always remember to toss your noodles. Now that I’ve explained the three pillars of a good stir-fry to you, here is the recipe. Enjoy, and let me know whether a stir-friy is one of the easiest meal ever. Bring 2 quarts of water to a boil in a medium saucepan. Julienne the scallions. Mix the soy sauces, sesame oil, salt, sugar, wine and white pepper into a small bowl and set aside. Flip the noodles over and add another tablespoon of oil around the perimeter of the wok and let the other side crisp up. Don’t stress if you can’t turn the noodles over in one shot, The goal here is just to get an even, light crispiness and to dry out the noodles during this cooking stage. In our pictures for this post, we used a large non-stick pan, which also works nicely. Set aside these noodles on a plate. After the noodles are uniformly golden brown, add in any vegetables or meat and toss. Add the rest of the scallions and toss the mixture again for another 1 to 2 minutes or until the vegetables/meat is cooked, but not soggy. High heat is a key requirement for this dish.